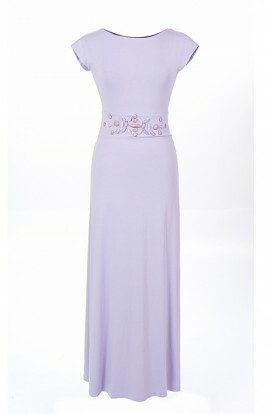 Kate knee length dress with cap sleeves and round neck in ice pink crépe. Fitted and clean lines complemented with an interested cape at the back turning into sleeves with a slit. Fastens with an invisible zip at the back, fully lined in gorgeous silk. Stunning fitted dress with 3/4 sleeves, that flatters everyone. Fully lined with a cobalt blue soft poly. The zigzagged material stretchy enough to fit you at the right places and doesn't show any lumps and bumps. Model is a UK size 10, 5 ft 10 and wearing a size Small Machine washable and made in England to the highest quality. Very sophisticated, fitted silk cotton jacquard dress with a round neck and sleeves that turn into a cape at the back. Printed in soft shades of blue and green geometric shapes based on lemon background. Fully lined and fastens at the back with an invisible zip.